In real time, PM3 shows resource availability either by person or by role so Project Managers can allocate resources to their project and immediately see if there is availability in the resource pool. Resource Management in PM3 is practical and visual, highlighting both under and over-allocated resources. These resource values are ‘rolled up’ into parent Plans (so, for example, the Resource Details of a Programme will sum the Resource Details of all its dependent Projects). Time booked to the project can also be imported from PM3time, our Timesheet Management System. 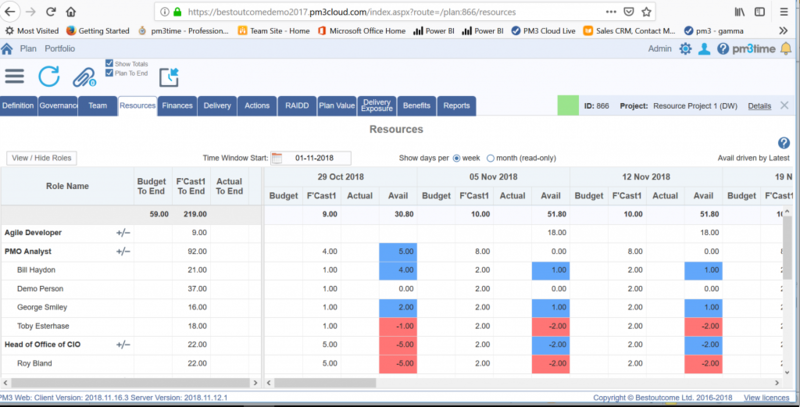 In PM3 you can have a budget demand and up to three forecasts of demand. PM3 is simple and colourful showing clearly when a resource is over-loaded or under-loaded.